Hey guys! 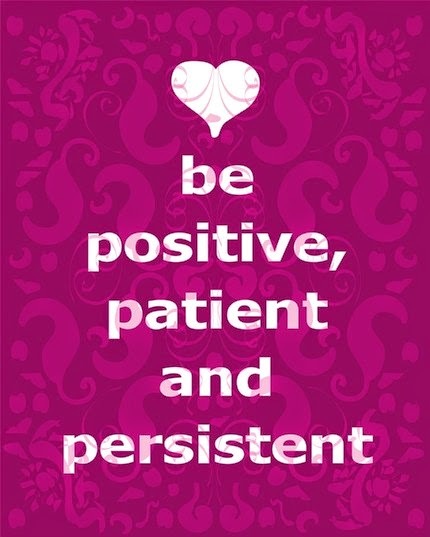 Today's little thought is one a quote I recently found and adore, about being the three P's, positive patient and persistent. This is such a cute mantra to have with you during the days when you feel like life is getting too stressful, we all have times when we feel like we need to be grounded and to keep going and to, well stay sane. I want to talk about the word persistent too. It's really useful to be persistent in some situations, for example if you applied for a job and you haven't heard from them or you're waiting to hear back from work experience, it can be good to make sure you have an email address or a phone number and if it's been a while, to keep trying them. Obviously not all the time you don't want to scare them off. It's also good to be persistent in your own personal goals, to keep trying and keep going, even if it feels too much at times. I for example have been on a super healthy kick at the moment, eating really healthy foods but this week having been half term I've not always been eating at home, I've been at other peoples houses or people have come over or its been pancake day so I have not eaten v healthily. The temptation to stop everything and just eat is one which I have thought about, and I've been getting really upset everytime I eat something I shouldn't have. But this morning I just thought screw it, lets have a week off and next week I'll just get back down to it and everything will be fine again. I think sometimes we all just want to give up, so let this be a reminder that if you break something once, keep going we all make mistakes! Finally, the positive part. It can be so hard to be positive a lot of the time I know. I would consider myself pessimistic person I tend to expect the worse, although in fairness to me, after a while I simply cannot stay down and I have to think of the bright side. Remaining positive in situations where things haven't gone your way is super important. It allows you to forgive yourself or the other person and to move on with your life and to realise that life isn't always going to be so bad. So remember today when your going about your daily buissnes and something goes wrong, be positive patient and persistent, you deserve to be forgiving on yourself!